Located a short distance from the gates of Frankfurt-am-Main, Europe's financial capital, the Kempinski Hotel Gravenbruch welcomes the guests in its own gorgeous large park, offering a sophisticated getaway far from the city's hustle. 284 spacious and luxurious rooms and suites with either lake or park view await you with all the comforts of a five-star hotel. 24 hour room service, air-conditioning, cable/pay TV, radio, telephone with voicemail, in-room safe, and mini-bar are among the conveniences of the rooms. For guests who are travelling on business, the hotel offers every necessary facility to ensure a comfortable working environment. In addition to the conference and banquet rooms, we have a professionally-equipped business center, and our personnel will be glad to help you with any questions. A total of 19 different meeting rooms with daylight and a capacity of up to 600 people provide a prestigious environment for gala dinners, festivities, and conference events. They are equipped with state-of-the-art technical devices and have views towards the park, which is the ideal venue for summer events. The gastronomic offer of the Kempinski Gravenbruch is very extensive and guests will have the possibility to try fine cuisine at the hotel's restaurants. We offer both regional as well as international specialties, which can be enjoyed in the warm ambience of our Winter Garden or in natural surroundings on the terrace. In either case, everyone is sure to find a dish to their liking. The lobby-bar puts an exquisite end to this culinary trip with a wide choice of cocktails and drinks from all over the world. The hotel offers its guests a wide variety of attractions to spend their free time. Individualized special beauty and wellness treatments will revitalize and relax you. Additional faciities include outdoor and indoor swimming pools, tennis courts, sauna, solarium, fitness center, and jogging track. Tax is included in the rate. 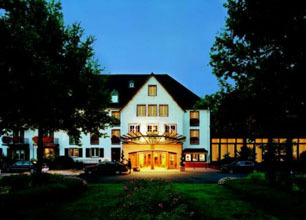 Set amidst beautiful nature in its own extensive park, the hotel is located only 15 minutes away from Frankfurt's business district, stock exchange and trade fair, as well as from Frankfurt Airport.